Mark Davis was at a loss to explain a below-par display in his first-round win at the UK Championship. The world number 19 beat Jak Jones 6-2 at the York Barbican on Thursday but told BBC Sport he did not reach the standard he expected. "It didn't really happen for whatever reason," the Sussex-based star said. "I just didn't turn up but all that matters is winning so I have got a chance to put that right in the next match." Davis is a four-time ranking event semi-finalist - including a run to the final four of this season's Australian Open. 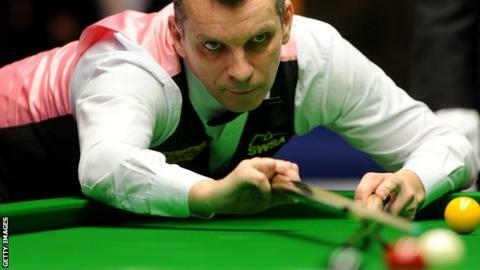 And the 42-year-old, who takes on Liam Highfield in round two on Sunday afternoon, said he feels in good form and has been practising hard despite a scrappy game against Welshman Jones. "He is one of the young guns coming through and a very good potter. I will have to play well against Liam because he is a dangerous player." Davis said he will also get encouragement from his run to the semi-finals in York two years ago when he beat John Higgins on his way to losing to Mark Selby. "That was a really good tournament," Davis, who lives in St. Leonard's, said. "I didn't really perform in the semi-final but the rest was really good. "I won't forget the game against John in a hurry: that was an amazing game. "I love playing here. York is a lovely place, the arena is tremendous - one of the best we have got, and it's a great tournament." Jimmy Robertson, also from Sussex, joined Davis in the second round thanks to a 6-1 win over Zhou Yuelong. "It was a good result but a really scrappy match," said Robertson, who faces two-time UK Championship winner Mark Williams in the last 64. "I am just happy to win not playing at my best. I know I can get a result playing well and scoring heavily but you need to win when you are not playing at your best. "He is in a bit of form and is obviously a very good player, but hopefully I can play well. Playing bigger names in the past I have thought too much about it."